Conductix-Wampfler have received the 2008 European Technology Implementation Award for development work associated with power and data transmission. The specialists from Weil am Rhein have developed solutions based on IPT (Inductive Power Transfer) technology, a transmission system which is setting new global standards in automation and conveyor technology, including floor conveying systems, electrified monorail systems and skillet systems, where IPT applications are being used in industry around the globe as an alternative to conventional technology with cables and conductor rails. Companies like Audi, Daimler, Ferrari, Airbus, BMW, Eurocopter, KIA, and General Motors have used the potential of this technology for years. 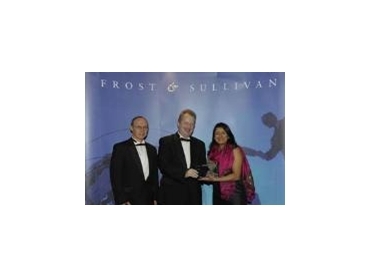 The technology award is granted every year by consultants Frost & Sullivan to companies whose research and development work has made a significant contribution to the improvement of industrial production processes and have documented it with numerous practice examples. More than 1,700 consultants develop innovative growth strategies for more than 1,000 companies. Mathias Wechlin, IPT Product Manager, Conductix- Wampfler said that increasing requirements in industry and complex, fast production processes require flexible, independently operated solutions in automation technology. Some conventional systems can no longer keep up with these new requirements. Inductive systems offer industry the flexibility it needs, allowing custom applications and flexible single components to supply power to conveyor systems which are sometimes specialised. Power transmission systems using the principle of electromagnetic induction have a variety of applications: a number of different floor conveyers are supplied with power using IPT; for rail-guided systems, there are electrified monorail systems in final assembly lines, sorting systems in distribution centres, inclined elevators in building technology, skillet systems in assembly lines, and systems in amusement parks working on this principle. Since development started in 1997, this technology opens up optimisation potential for a variety of applications in nearly every industry and the private environment, Mathias Wechlin added. He continued saying that before deciding whether conductor rails or inductive systems will be used for transmission of power and data, plant engineers and operators need to weigh a number of arguments carefully. Clear arguments for IPT solutions include their safety and availability, the elimination of maintenance work related to mechanical wearing parts and galvanic contacts, their reliability, transmission rates, and the independent operation of multiple consumers in a single system. The suitability of the system for extreme environmental conditions and operating costs which are often lower in the long term are more basic reasons to choose an inductive solution. For floor conveyor systems, the use of IPT means that no mechanical guards or special support structures are necessary for the transmission of power and data. Error-prone open copper contacts can be entirely eliminated as sources of error. Installation in the floor makes surfaces accessible without restriction. For skillet systems, there is a functional solution with insulated conductor rails. The deciding point for these applications is that all the basic conditions are satisfied and the transmission system is mounted cleanly. An inductive solution here primarily has the advantage that different voltages are no longer an issue, so that corresponding safety switches can be eliminated. The mechanical engineering is significantly simplified with inductive solutions. For electrified monorail systems, IPT allows new applications, for instance in process technology. Applications are quieter, cleaner, and have greater tolerances. Conventional conductor rail systems can quickly meet their limits when it comes to operating speed and environmental conditions. Conductor rails also require high precision in installation, and they generate carbon dust. The power collector can break off, resulting in significant downtime. Inductive power and data transmission, on the other hand, is free of mechanical wear, has no transitions at transfers or locks, and cause no problems. Dampness and contamination have no influence on transmission. And operating speeds are not limited for tracks operated with IPT. Radio-based systems with wireless LAN technology must be measured by their susceptibility to error. According to Mathias Wechlin, IPT is a stable solution when vehicle control is needed without downtime or signal loss. The number of antennas which must be installed and configured depends on the specific installation. The frequencies on which signals are transmitted must be clearly regulated, IPT is a simpler solution. Signal transmission takes place along the path laid out, and is limited to the field near the line. Additional options for floor applications are the capability of guiding vehicles along the power line, and determining their position using position markers. In this case, all three functions are available in a single pickup box as an integrated solution. A significant argument in the decision is usually the direct investment cost. For conventional solutions, these costs are often lower than for inductive solutions. If the failure or downtime of vehicles is reduced, the number of vehicles used can often also be reduced, and the installation operated more ideally. IPT is now the global state of the art in conveyor systems in many automotive plants. Particularly suitable for operators including power and data transmission, vehicle guidance and positioning if necessary, and a service agreement, Mathias Wechlin added.